Today marks the 30th Anniversary of the late Bill Muncey’s untimely death behind the wheel of his fabled Blue Blaster, nee Atlas Van Lines Unlimited Hydroplane at the Acapulco World Championships. So, it seems eerily fitting that Bill’s final ‘BigBoat, the 1977-81 Hull: Cabover Design with rolls Royce Merlin powerplant Is currently being restored at this very moment in Kent, WA, as I happened to call to inquire on the Hull’s progress the very day that she was being flipped over in the Restoration Shop... To which Don Mock (Crew Chief of the project) informed me was a pretty momentous occasion! As the Hull’s been upside-down for the past 18-months having its entire bottom side rebuilt - including newly re-fabricated sponsons, etc. Don says the boat’s frames were all made out of one-inch thick Honeycomb-Aluminum which is no longer utilized, with Honeycomb/Nomex being the preferred method these days. Mr. Mock gave me a brief rundown of the boat’s past life, which instantly made me think of Indianapolis’s Hall of Fame museum’s inhabitants and the stories those Old Cars could tell. As the boat was not only involved in a fatal Blowover accident - but was split into two when Chip Hanauer ran over it! (Obviously a fact I was unaware of) The boat was then cosmetically repaired with plywood decking in order to become a “Trailer Queen” and was on display in the Smithsonian Institute for a few years - ‘Circa 1982-84/85. Fran Muncey, Bill’s widow then took the boat to San Diego for awhile before donating the boat to the original Hydroplane museum at South Park, an industrial complex in Washington along the Duwamish River. I asked about the weight of the boat; as Arch-nemesis Bernie Little’s Miss Budweiser that was a constant thorn in Muncey’s final years was reputed to weigh a stout 7,000lbs (or more) to which Don replied the Atlas was ridiculously light for its day; probably 5,000lbs - as our other Atlas; the 1982 Hull weighs 5,800lbs. With Don guestimating they’d probably added another 500lbs to the boat while rebuilding all of the frames - which he’d be happy with and wasn’t really a concern for the project - stressing the Museum had already pledged the boat would only be run for very special occasions and see limited running when finished, due to its historic nature. Having won 25-races, Three-in-a-row Gold Cups and two National High Points Championships! Yet its funny how for nearly four decades I’ve grown up thinking it was Mickey Remund at the wheel of the Miss Budweiser - instead of Dean Chenoweth, as I can still vividly recall that splendid looking blazing red and white “Beer Wagon!” Thus, perhaps this is why Messer Chenoweth was my very first-ever favourite Unlimited Piloto, eh? As he was simply Numero Uno to Mwah until his untimely death at Tri Cities, WA in 1982; before his mantle was taken over by another prolific BUD driver named Jim Kropfield; but I digress again - as Kropfield arrived on the scene after the Bill Muncey era concluded. As it seems totally Symbiotic that Villwock would overtake the Master’s mark on his original Home River in the Piece de la Resistance Gold Cup - further shattering Muncey’s accomplishments by claiming his ninth Gold Cup victory, one more then his predecessor. Yet William Edward “Bill” Muncey also won the APBA National High Points Championship Seven-times along with Eight Gold Cup victories and Four World Championships. As Muncey won his first two Gold Cup crowns in the Miss Thriftway, (1956-57) before a second Deuce aboard Miss Century 21; (1961-62) while Bill’s final four Gold Cup triumphs all came aboard Atlas Van Lines boats. (1972, 1977-78-79) As ironically his first Atlas Van Lines win was for Joe Schoenith, the very owner he’d lost his first potential Gold Cup too. And it further seems totally symbiotic that the torch was ultimately passed to Bill’s hand-picked successor: Seattle’s very own Chip Hanauer in 1982, the year after he’d died. Further making it somewhat karmic that Messer Hanauer would make his Gold Cup final debut at Lake Washington in ’77 in the obsolete Tad Dean’s Body Shop (ex-1957 Breathless II) when Muncey was victorious as a Driver/Owner for the very first-time - en route to becoming the very first ever six-time Gold Cup winner. Yet according to Fred Farley, Official Historian of the APBA - the 1981 Unlimited Hydroplane season was primarily dominated by Miss Budweiser and Dean Chenoweth in my all-time favourite ‘BigBoat - the ALL conquering ‘Juggernaught! The Rolls Royce Griffon, (1980-85) although I did somewhat like the quirky “Bud Bubble” predecessor - Bernie Little’s debutant Turbine Beer Wagon in ’86. Yet there’s simply nothing quite like the roar of a piston powered Hydroplane! Thus, I find it somewhat appropriate that Bill Muncey went out in a Blaze Oh Glory, albeit ultimately failing to beat the Grim Reaper that fateful day in Acapulco when he was riding on the ragged edge of control trying to keep his arch-rival Chenoweth from obtaining the inside lane - in what was only the third time that season he’d have potentially defeated Bernie Little’s King of Beers; before a wicked Blow-over accident took his life at 175+ mph! As I cannot help wonder if Muncey would have been willing to adapt to the new fangled Turbine era which were ultimately right around the corner - as it seems fitting that William Edward Muncey’s legacy stays firmly ensconced in the Post-World War II Aircraft engine powerplant era. As many things changed that final season of competition, for instance; Muncey’s unheralded 27-consecutive Gold Cup finals streak was snapped at Lake Washington - having participated every year beginning in 1955! (A streak akin to A.J. foyt’s untouchable 35-consecutive starts at Indianapolis...) As Muncey was forced to withdraw after having been pummeled by multiple Roostertails after having ‘Chopped a competitor in a qualifying heat - where his boat would go dead in the water and sustain Hull damage. And that year’s Lake Washington Gold Cup would see the arrival of the first Turbine-powered competitor with Jon Walters at the Pay ‘N Pak controls, while Brenda Jones would become only the Sport’s second ever woman to participate in a Gold Cup event. Meanwhile in the virtually unknown Industrial complex in Kent, Washington resides the 1982 U-00 Atlas Van Lines, usually perched upon its trailer vertically alongside its arch-rival 1980 U-1 Miss Budweiser in the ‘lil gem of a Museo, aka the Hydroplane and Thunderboat Museum. 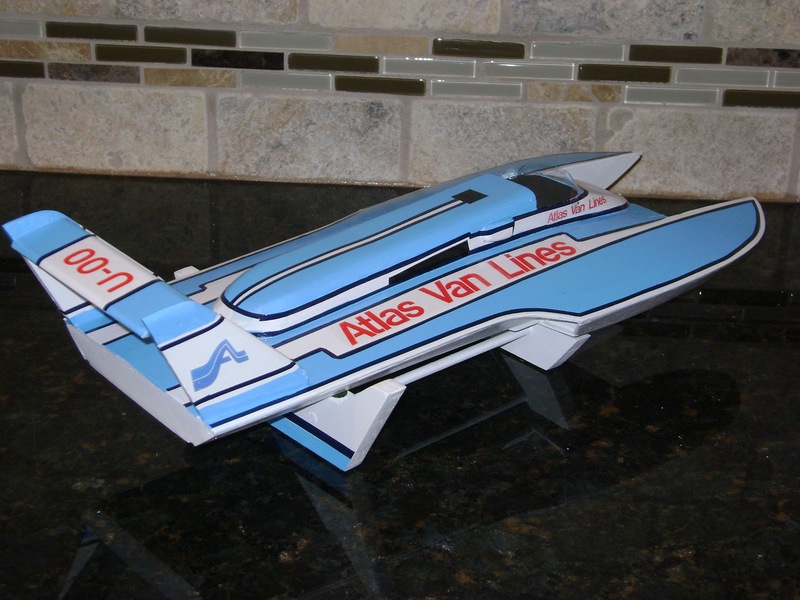 Thus, fittingly the Thunderboat facilities website has a link denoting how the museum has begun working upon the fabled 1977 U-1 Atlas Van Lines; the very exact boat that claimed the late Sport’s Godfather’s life at Acapulco, as apparently this Hull was utilized for five seasons. Thus, please feel free to check out the Hydroplane Museum’s website by clicking here!